Weekend late-night service between the Olympia Transit Center and The Evergreen State College. Nightline operates Fridays, Saturdays and Sundays through June 16, 2019. --- --- --- 11:55 p.m.* 12:00 a.m. 12:04 a.m. 12:11 a.m. 12:25 a.m.
12:00 a.m. 12:07 a.m. 12:13 a.m. 12:25 a.m. 12:30 a.m. 12:34 a.m. 12:41 a.m. 12:55 a.m.
1:00 a.m. 1:07 a.m. 1:13 a.m. 1:25 a.m. 1:30 a.m. 1:34 a.m. 1:41 a.m. 1:55 a.m.
2:00 a.m. 2:07 a.m. 2:13 a.m. 2:25 a.m. 2:30 a.m. 2:34 a.m. 2:41 a.m. 2:55 a.m.
* This departure is part of the normal Route 41. At the library, Route 41 becomes the Nightline. The Evergreen State College contracts with Intercity Transit to provide late-night service, Nightline, between downtown Olympia and the college. 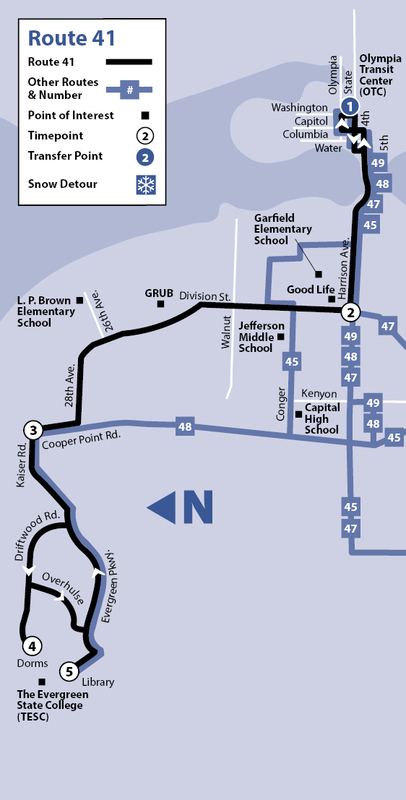 The service is open to the public and serves all stops along the route. Regular fares apply. For more information, visit evergreen.edu/commute. 9:00 p.m. 9:07 p.m. 9:13 p.m. 9:25 p.m. 9:30 p.m. 9:34 p.m. 9:41 p.m. 9:55 p.m.
10:00 p.m. 10:07 p.m. 10:13 p.m. 10:25 p.m. 10:30 p.m. 10:34 p.m. 10:41 p.m. 10:55 p.m.
11:00 p.m. 11:07 p.m. 11:13 p.m. 11:25 p.m. 11:30 p.m. 11:34 p.m. 11:41 p.m. 11:55 p.m.